Z.-H. Gu (zgu@surfaceoptics.com) is with the Surface Optics Corporation, 11555 Rancho Bernardo Road, San Diego, California 92127. G.-D. Peng is with the School of Electrical Engineering and Telecommunications, University of New South Wales, Kensington, Sydney NSW 2052, Australia. The enhanced backscattering from organic laser gain media that are bounded with one-dimensional (1-D) and two-dimensional (2-D) rough metal films was investigated. 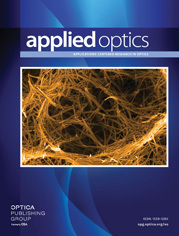 We prepared several organic optical gain materials by doping laser-active dyes in matrices of acrylic polymers. These materials produced efficient and broadband fluorescence emission in the visible wavelengths during the pumping of a pulsed YAG or cw argon laser. These gain materials were sliced and coupled with 1-D or 2-D randomly rough gold films with large slopes. An experimental investigation was carried out with a He–Ne laser as the scattering source and the optical gain provided by a cw argon laser. The enhanced backscattering and the satellite peaks located about the enhanced-backscattering peak were obviously amplified, with their widths narrowed. These experimental results agree well with previous theoretical predictions.